Only once in a while do I drink Dr Pepper and even rarer do I drink Mountain Dew. Several years ago, I began noticing in different stores how both sodas are knocked off in different store brand lines. All of you probably know about Mr. Pibb, which strangely did not pursue a doctorate degree and now has this new name and it's now hard to find in many areas. One day I walked into my local Kmart (yes, they still have that store where I live) and noticed Dr Rocket and Citrus Mountain. Another day I asked a worker at the store to get some Dr Rocket down for me and he said "Dr Rocket? Dr Pepper's right here." For a while Kmart discontinued the American Fare store brand sodas, but recently brought them back. Unfortunately, I have not seen either Dr Rocket or Citrus Mountain. This occurred not too long before I discovered a website (that has been frequently updated) containing numerous Dr Pepper knockoffs. Since then I've had something of a fascination with this subject, though not enough to produce a webpage :-) It would probably look a lot like the one linked above :-) I have seen other collections of Dr Pepper clones on the web, but the one posted is probably the most definitive, IMHO. Almost every Dr Pepper knockoff contains the doctorate degree in its name, but there have a been a few--such as the aforementioned Mr Pibb--that did not pursue a graduate education and other non-degreed knockoffs. One non-degreed knockoff I'd like to mention is the one called Southern Lightning (at Wal-Mart), which did eventually get its doctorate, becoming Dr. Thunder. I believe this occurred around 1997, and not having shopped at Wal-Mart much prior to that year, I sadly missed ever getting Southern Lightning, but have on occasion gotten and drank Dr. Thunder. (It's been a while since I last had any of the stuff, but I like it all right.) Something about the name Southern Lightning that has come up a few times. Many people think "Southern Lightning" sounds like booze. Someone once said (in a discussion on one of the Google Newsgroups I frequent), "I'd expect something called 'Southern Lightning' to be 130 proof, at a minimum." Minimum? 130 proof? That's 65% alcohol. Obviously, Southern Lightning sounds a like a cross Southern Comfort and White Lightning, two very well-known types of booze. A friend of my family actually said this in an e-mail once. Why Wal-Mart changed the name, I have no clue, though they may have wanted a name that sounds like that of the one that is being knocked off. Southern Lightning, incidentally, was a reference to the Texas origins of the drink under discussions, as was Texas Fizz, also pictured on the page of non-degreed clones listed above. before becoming Dr. Skipper and the recently "The Dr.". Although the last time I was at my local Safeway, I saw them carrying Dr Skipper (in the second can on the right you see in the link above). I now wanna get some, the next time they have their house brand sodas on sale. 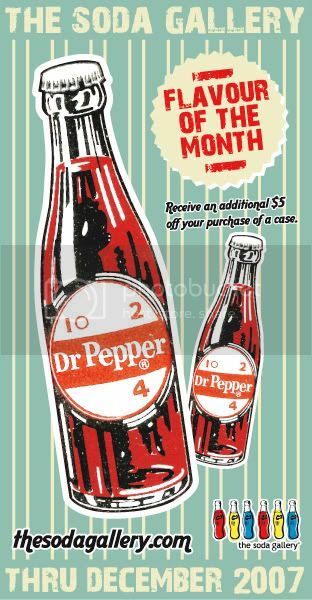 Another thing about Dr Pepper is that is worth noting is that there is no period after Dr in the name. Yes, a lot of people have seemed to be unaware of that because it is only proper punctuation and the period does occur in the some of the clone names. Apparently the manufacturers of the various knockoff names were also unaware of this absence as well. In my last blog, I mentioned the clone Dr. Bob, (also pictures on the page of clones linked above) because of my fascination with the name Bob (the subject of my blog yesterday, Jan. 15). Originally, this post was to be about both Dr Pepper and Mountain Dew knockoffs. Unfortunately, there was so much to say about Dr Pepper's many impersonators that I decided to write about Mtn. Dew clones in another blog. I'd also like to make a few comments on some of the names I encountered (see individual pictures on the clones collection page above and links to stores at which they were purchased). Dr. Hy-Top: the name kinda reminded me of sneakers that were popular in the 1980s. Doc Holiday--they actually named a soda after an infamous outlaw? Dr. Springfield--sounds like this was a character in the TV universe of The Simpsons, a founder (or relative of one) of the the famous animated family's mysterious home town? and when I asked if they have store-brand soda, they relied "We have Shasta." I was disappointed not to find this. The people working in the store claimed there is no store-brand soda at Smart and Final. Thіs is very interestіng, Үou are а νery sκilled blοgger.